Do you love to plan, or are you a 'by-the-seat-of-your-pants' type? Even if you are smack dab in the middle of the spectrum, planning is something we all need to do. I know, life doesn't always let you stick to your plan... but it's still a good idea to plan. 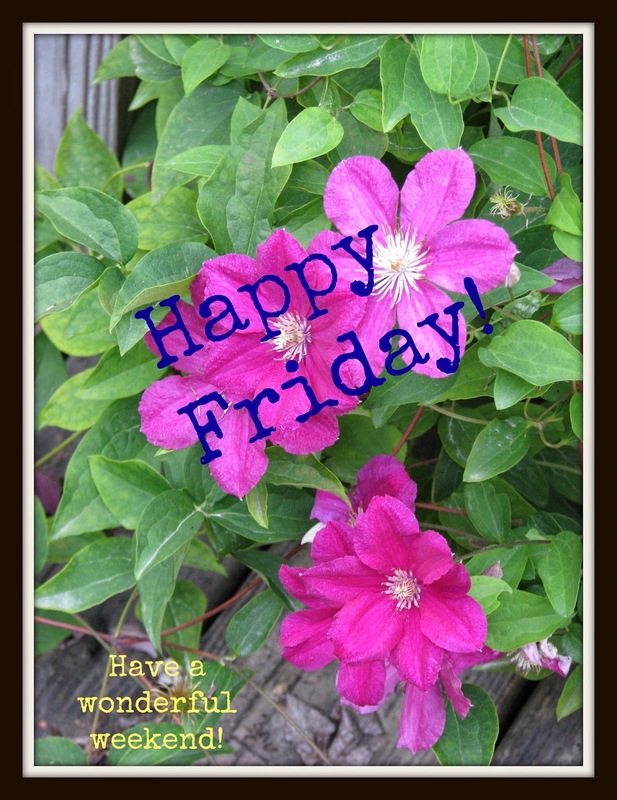 I was thankful for the opportunity to plan this week, even when life threw us a major curveball. The curve? The internet went down, and we needed a new modem, and we had to wait on our provider company... get the picture? It's quite hard to re-adjust your life to a no-internet status when you've gotten used to it, AND when you're trying to get blog things accomplished! Yet, I can still be thankful for planning. Even though I didn't get to print out a map I thought I wanted, didn't get to Google my questions about harvesting potatoes, and even though you're reading this "Thursday" post on a Saturday afternoon, I was still thankful for planning. Not having regular internet service forced me to follow what I put down in my paper planner to do every day this week. Hmm. I think we got more accomplished, at least more of what I had planned to accomplish done because of not having the distraction to go look things up. Today, our internet is working (hurray!) Yet we still chose to stick with the written plan, which included a long family bike ride this morning. The internet was still here when we got home. Planning is not always my favorite thing to do, yet I have come to understand the wisdom in making plans. If God decides to change them, I want to be available to hear His direction, but if He does not, I want to know where we're going. As parents we don't plan to fail, yet we often fail to plan! 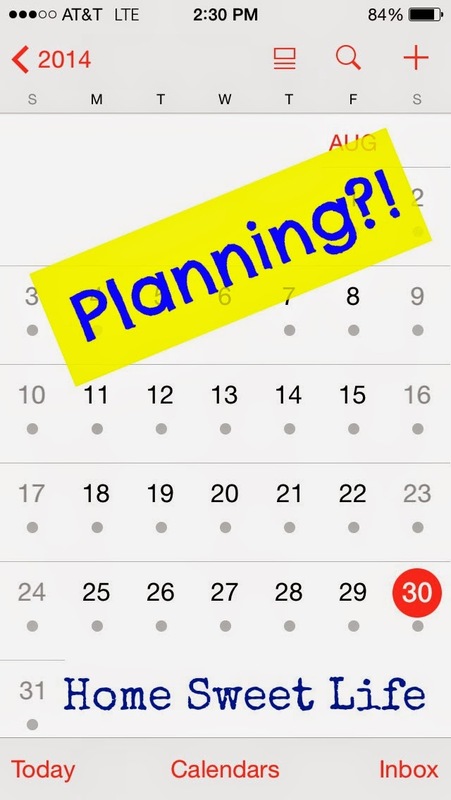 Your plans might be extremely detailed, or quite vague, yet they are STILL plans! Without any plans you drift, and your children may drift with you, or away from you. With plans, everyone has an idea where your family ship is headed. I want to encourage you to make some family plans, outside of just school plans. They may not all come to fruition, but the ones that do may just be beautiful! Then you'll be thankful for planning too! 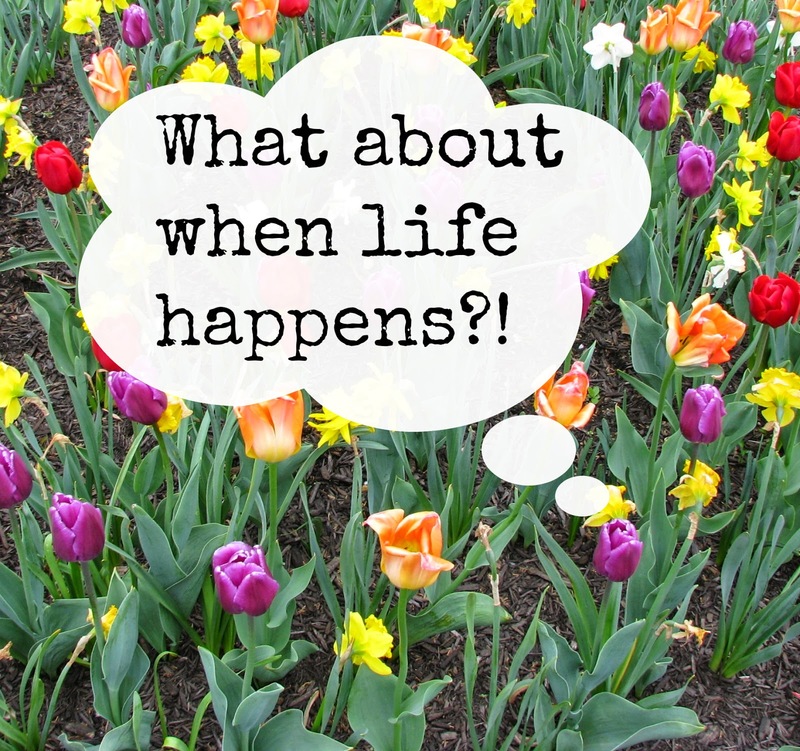 What about when life happens?! You might remember that I've mentioned that Moms worry too much. As a general rule, we do. While I'm getting better at trusting God to handle the details, I know I still have a long way to go. Want to know the one time when I see a lot of Moms worry? When life happens. What do I mean? Oh, things that we all might encounter during the years of homeschooling... a broken bone, a sick child, a job change, someone we love being admitted to the hospital. Having been through all of these in recent years, I'll be honest and admit I've worried too. How will we ever get "caught up?" What would that look like, and does it matter anyway? First, breathe, second, pray, third, let go. Let go of your plans and try to embrace the plans God has for you. I might have had great aspirations of finishing a 36 week course with the girls in 20 weeks. I might have had designs to clean the house, plant the garden, or even read a book, but God had other plans. How does this work in the real world? When one of the girls is sick, we usually end up with a 'documentaries on Netflix' day. This is a great time to pool ideas from your friends. If you haven't thought ahead and made a list of possibilities, ask them now. Social Media can get you a few great answers, some decent answers, and a couple mediocre answers in about 45 minutes. Usually someone is sitting there watching your post pop up in their newsfeed, and will share some ideas. If you're not sure they will work for your children, click over to Netflix and read the descriptions. It doesn't really matter how much they learn, it matters that you can keep an eye on them all day, from the comfort of the couch, near the bathroom and the kitchen. Since our girls are High School age, we can always just peruse the 'documentaries' listings and find something. If your kids are younger, pay attention to the descriptions. If your children are little, pick a sure-fire movie instead of a documentary. Maybe Winnie-the Pooh?! Job change? Yeah, been there, done that more times than we care to recall over our past 11 years of educating at home. How does that work? For us, in bits and pieces. If you need to help your husband proof-read his resume, or prep for an interview, your kids just have to learn to adapt. Some people are very hands-on in their teaching style (not me) and letting their kids work independently may seem little scary. (If you've taught them to work independently, it will be a great help right now.) In the big scope of life, it really doesn't matter if your child only does 3 math lessons this week instead of 4. If you are so committed to your schedule that you can't be flexible to be your husband's 'help-meet' when he deeply needs you, then you love your schedule more than you love God. Let go. Start writing in pencil, because from experience I can tell you, this will NOT be the only time you are going to have your homeschooling interrupted. Notice I said interrupted, not stopped. Just because your child isn't doing lesson #143 in their science book today does not mean they won't be learning. As homeschoolers, we have got to abandon the wrong idea that learning only happens from 8 a.m. to 4 p.m., Monday through Friday. If you are still clinging to this idea - stop! 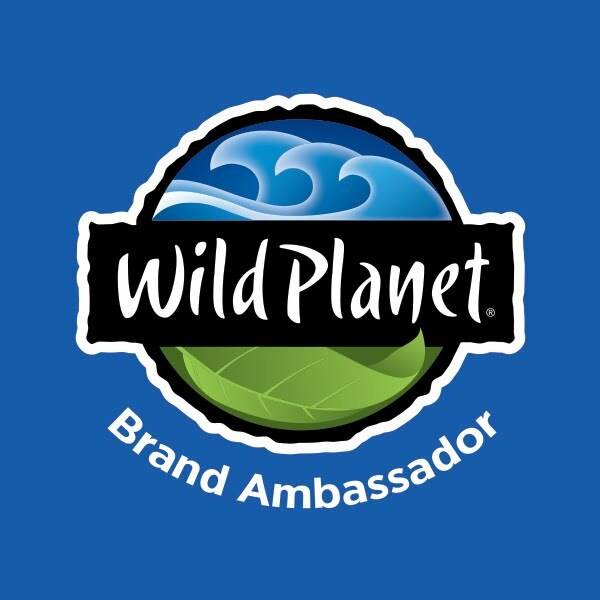 Our children have learned loads of life lessons about to how act (and how not to act) by watching how Kurt and I interact with each other and with our jobs through tough times. Life is not all sunshine, rainbows, and unicorns! It is healthy for your children to see that you struggle. It teaches then to turn to God (assuming that YOU are turning to God for help) for answers they cannot find on their own. It also teaches them about contentment. You may not find your dream job on the first try. Most people don't. Yet, you can be thankful for any opportunity God brings you, and ask Him to teach you through the struggle. Broken bones, hospital admissions? We've been there, done that too during these homeschooling years. In our lives God has used His people to step in and parent our daughters when we couldn't. A few years ago, Kurt was in a car accident and broke his leg. During the first two weeks he was home (of 11) the girls spent each day with various homeschooling friends and their families. Did they get a lot of schoolwork done, no, but I didn't expect them to. They were fed, loved on, and comforted during the times when I couldn't be there taking care of them because I had to drive Kurt to his various Doctor appointments and tests, not to mention the seemingly endless phone conversations about insurance, or keeping track of times for his medicine. This was the body of Christ in action. The girls got to play, swim, draw, spend time with their friends, and we got food. Lots and lots of delicious food, that I didn't have to shop for or prepare. The girls still talk about the things they did during those two weeks. Earlier this year Kurt became violently ill. He ended up spending several days in the hospital with pancreatitis, and eventually having his gallbladder removed. Once, again, the body of Christ sprang into action. Rides for the girls, meals for the three of us that were still eating something other than jello, even some gifts to help pay our bills. Did the girls finish every math lesson on time? No. Did they learn about serving others through being served? Yes. Our school days went a little later in May than I had planned, our garden isn't outstanding this summer, and we still have some decluttering to do in the house before next week. These are all minor trifles in caparison to the great love and grace that the girls were reminded of through the actions of friends and family. Kurt is healed, life goes on, learning continues. At the end of each day/ year/ interruption to our schedule, as I look back, I see that God has been faithful to work through HIS plan to educate our daughters when I couldn't. When I look at our goals for our homeschool, I see He has met all of them already, and the girls aren't even ready to graduate yet. What an amazing God we serve! 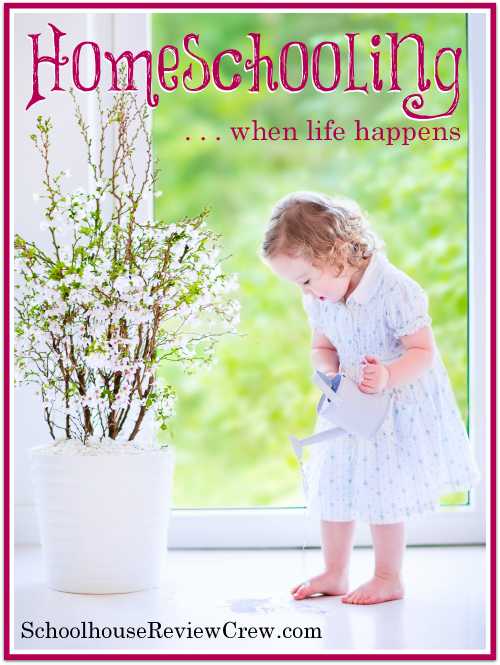 When life happens, remember that you really do want God, who has a masterful plan, in charge of your life and your homeschool. Remember, breathe, pray, follow HIS plan. I love watching butterflies. Yesterday we were blessed (thanks Mom!) to go to the Indianapolis Zoo and see the many animals including the butterflies. The Indianapolis Zoo almost always has a butterfly exhibit in the Gardens part from late May through Labor Day. 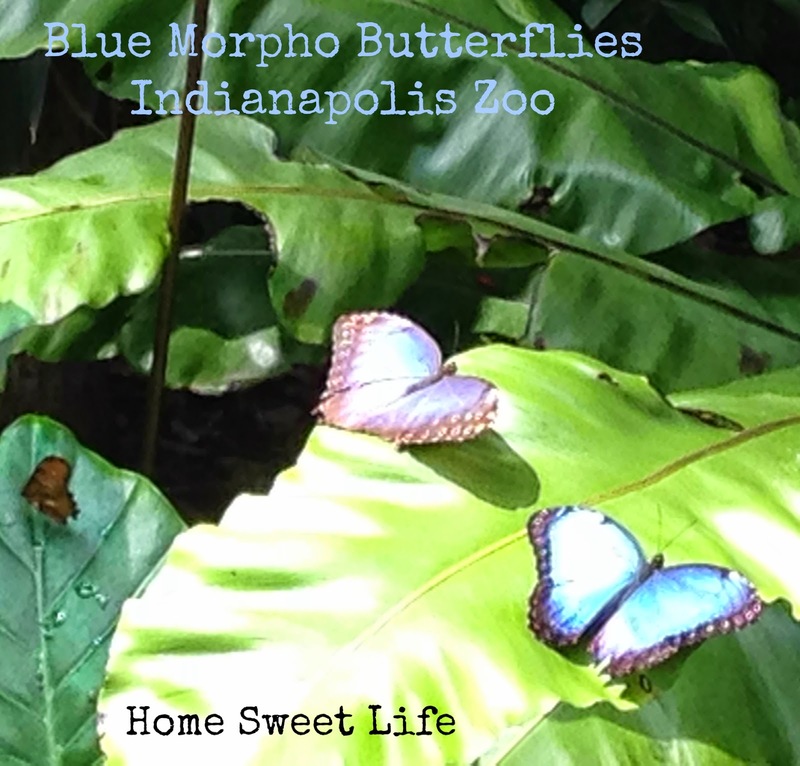 My favorite butterflies to watch are the Blue Morpho butterflies from South and Central America. I've never seen one on the wild...because I've never been to the jungle, so I'm thankful to get to see them at the zoo. The Indianapolis Zoo hatches their butterflies from chrysalises they have on display in the butterfly nursery. Since its getting closer to Labor Day, there weren't as many butterflies to watch as you can see in July, but there were still plenty to enjoy! Butterflies don't live long lives, but they spend their lives doing what God made them for. I love the variety of colors and designs! I have learned to tell a Blue Morpho is getting near the end of its life when its brilliant color starts to fade, and/or the wings start to get tattered edges. It's really hard to get a good picture of them because they often close their wings when they land. The underside of they wings is the same colors as an owl butterfly, but with a differentiating pattern. Only the tops are blue, which makes me believe God made them just for their beauty. 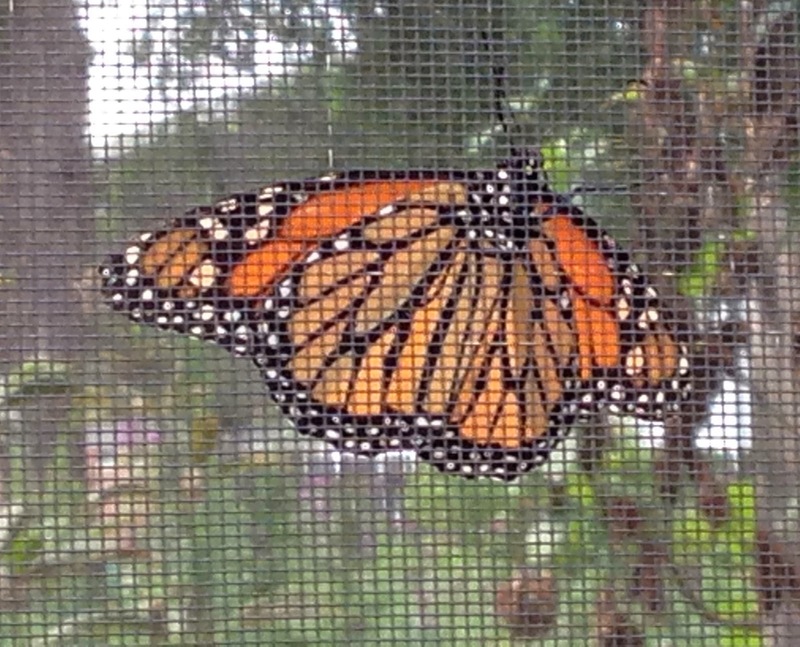 When it finally stops raining, I hope to see some monarch butterflies in our own butterfly garden. Until then, I'll be thankful for all the beautiful varieties we saw yesterday! I am so thankful to live in America, where we have choices. I am thankful that we get to choose how to live our lives, what our vocations will be, what we eat, how we educate our children - there are just SO many choices we get to make! Sometimes those choices can seem overwhelming, but most of the time, they just give us a chance to see how diverse God has made each one of us. I am a blue jeans and t-shirt kind of gal. I can dress up, or get grubby, with the best of them, but I prefer just to be me. I am usually not a trend follower. I like being me, and I know that God in His infinite wisdom is not yet done making me into the woman He wants me to be! I know that my life will continue to ebb and flow and that change will happen yet again. My comfort in knowing that God is in control of my life allows me to find joy even in the struggles. God grants me grace daily to be His child. I am so thankful that He gives me choices. Sometimes those choices are as simple as blue or green, beef or chicken . . . sometimes they are more complicated, like choosing a math program for one of our daughters. I am thankful for sunshine, cloudy days, and rain. While God chooses the weather, I get to choose my attitude. Hopefully I am choosing wisely! 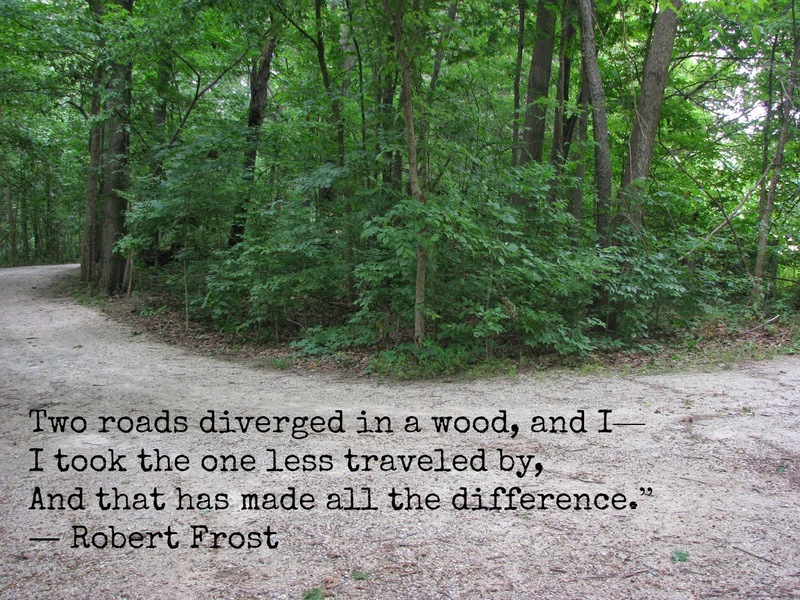 When I look at my life, I am often reminded of Robert Frost's poem "The Road Not Taken." I am thankful to be able to choose the "one less traveled by." We are thankful for how often we get to take field trips! We started off going to see the girls' projects that are on exhibit in the 4-H buildings, then we headed over for Arlene's category in the 4-H Fashion Revue. Once done at Fashion Revue, we headed to the car for those sandwiches. It was great timing because it started to rain just after we got to the car. So we ate in the car while waiting out the 15 minute shower. Then on to some of the rest of the fair. We visited friends who were showing their 4-H llamas, then we headed over to the Dairy Bar for ice cream - yum! 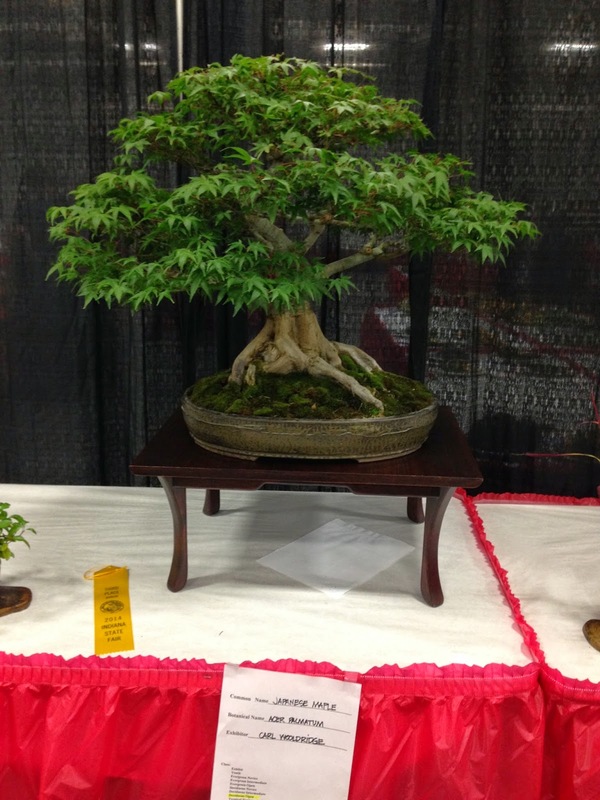 The Horticulture building was also hosting a Bonsai competition - cool! A walk past the Midway brought us to a perennial favorite, the DNR building. Fish, forestry, and a little archery practice . 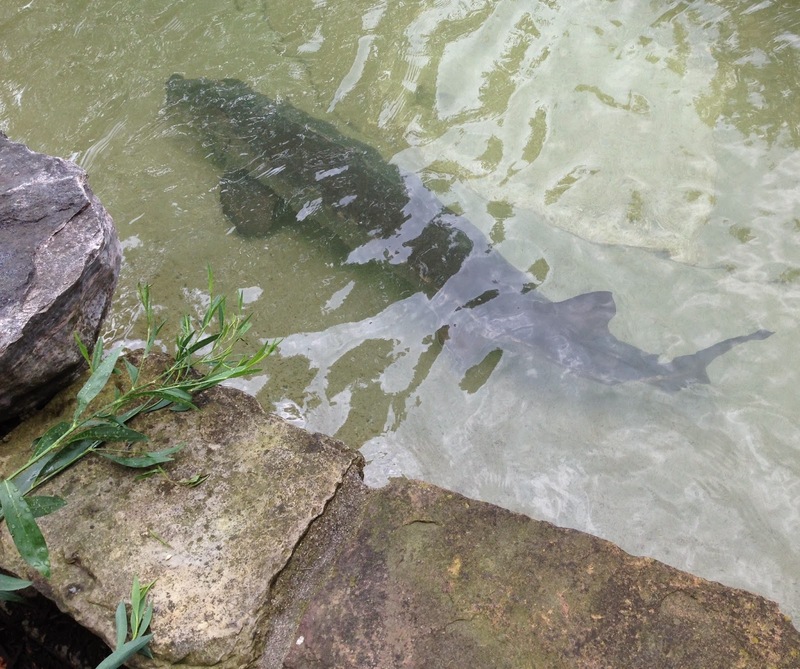 . . they can all be found in the DNR building or its gardens. One of the best parts - the butterfly garden! 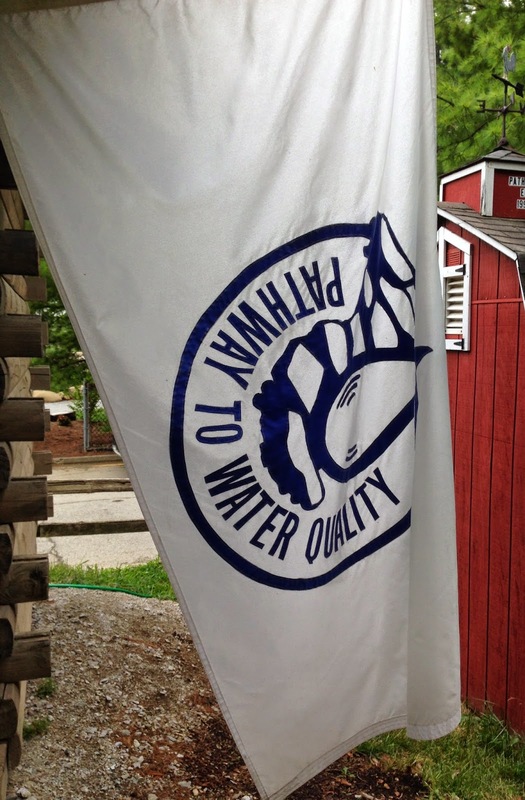 One year when the girls were still really little (a long, long time ago,) we stumbled upon the Pathway to Water Quality. 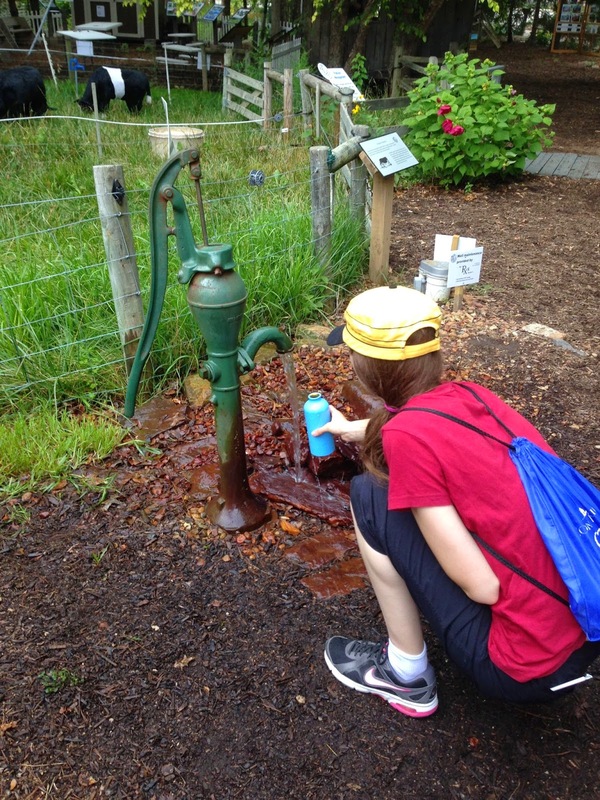 Now it's an annual stop to fill up our water bottles with well water. Arlene was trying to keep her stack of free back issues of Outdoor Indiana from the DNR building dry, so Emily filled the water bottles. 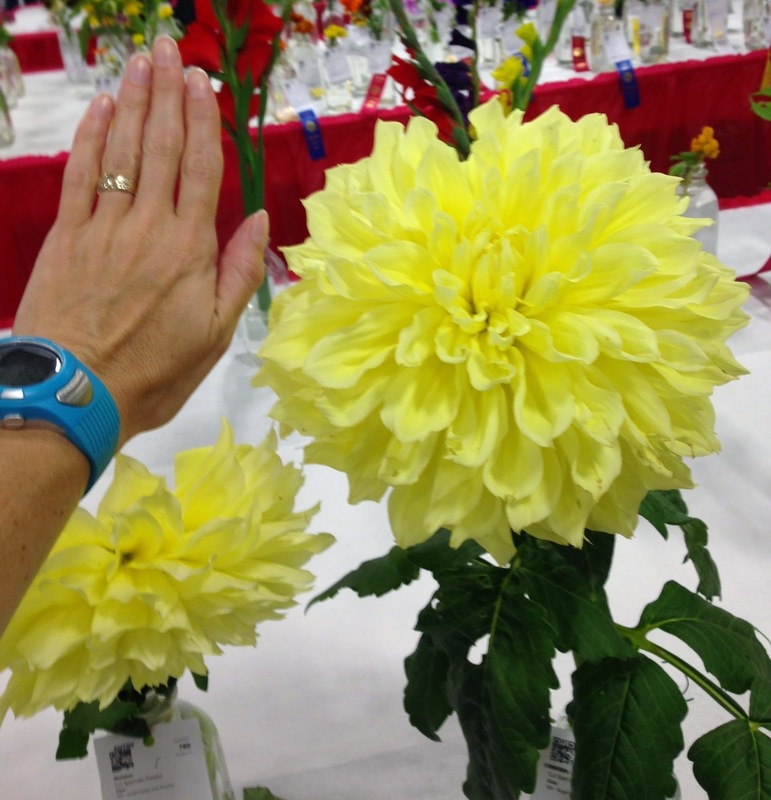 We only visited a small fraction of all there is to see and do at the Indiana State Fair, but we have a plan. We're going again next week! We finished up Friday's visit with a free concert by Beatles tribute band BritBeat in the newly renovated Coliseum. It was a great show, and the Coliseum looks terrific. We had plenty of reasons to be thankful! The Indiana State Fair runs through August 17th, why not plan a trip of your own? Quite often in the world of reviewing, we are given one choice - review item A - or don't. This review from Roman Roads Media included a plethora of choices, which made it hard to choose just one item to request. 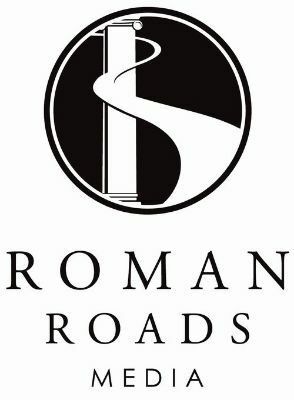 You may have heard of Roman Roads Media before. They have a lot of great resources to choose from, like Old Western Culture (The Greeks or The Romans,) Visual Latin, and Dave Raymond's American History I and II just to name a few. After watching oodles of intro videos on their website, Emily and I asked to be able to review their Economics for Everybody Curriculum. It has been a big hit in our house! 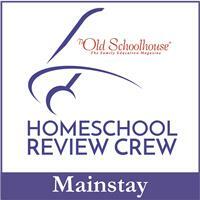 When you're done reading our review, I encourage you to click on the Schoolhouse Review Crew banner at the bottom and go read about some of their other great products. Economics for Everybody Curriculum is a solid, Biblically based explanation of economics, that includes 12 video lessons and a 236 page study guide. For the review, we received the downloadable form of the video lessons, and a PDF of the study guide. The course is also available as 2 DVD's and a printed study guide. The downloadable format costs $36, while the DVD version costs $45 (plus shipping.) This course can be used by families, small groups, or co-ops where the members are 6th grade (around age 12) and older. In the study guide you will find an introduction to the course that suggests how to divide the work to be done based upon the type of group that is using it, and the ages of the members. Thus, if your teens are going to use it for High School credit, they will probably need to select books from the 'List of Additional Resources' pages to read. Understand that this course IS a complete course on economics, but I would recommend you have your teens read at least one of the additional books to expand their understanding of just how much economics affects all parts of our lives. Since we did this review in the Summer, Emily (age 16) didn't have to complete an additional book while we were reviewing, but she will be reading more this Fall as we continue the course since Economics IS a state required course here in Indiana. I had recently read one of the recommended books, so I didn't do any additional reading during our review period. If you are using this course for a small group study, read through the suggestions and let the group decide if/ when they want to use any additional resources. 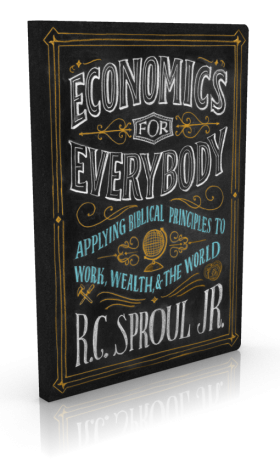 I appreciated the way that Mr. Sproul uses passages from the Bible to help explain the basic principles of Economics. With lesson titles like "And God Created Economics," "The Economic Problem of Sin," or "The Route From Scarcity to Plenty" you can imagine there is a lot of Bible teaching going on in this course, and you would be correct! As a Christian, I find this refreshing and encouraging. What is the use in teaching our children about economics if they're not understanding why it is important? We need to have a goal in mind for our family. Our family's goal with learning about economics is to better steward the resources God has given us. In lesson One "And God Created Economics" you both hear and read this definition: Economics is man making choices as to how to best use his limited resources in order to be a good steward before God. Each lesson builds upon what you have previously learned. Now that we are about halfway through, Emily has a good grasp on basic economics principles, and I have had a refresher course (taught from a Biblical perspective, not a materialistic one.) Kurt watched one of the early videos with us and was impressed with the quality of the teaching. If you choose the downloadable version, know that you can either stream the videos, or download and save them for later viewing. We chose to download and save them to my computer. At times, it seemed like everybody in the house wanted on the internet for something at the same time that we were trying to watch a video. That can put a strain on even the best DSL connection, so I found I preferred having them already downloaded so I didn't run into a buffering issue. We chose to view the study guide on the computer instead of printing it out. 236 pages is a lot of ink! Each chapter in the study guide begins with suggested Scripture readings, lesson objectives, and a quote about economics. Then comes the detailed outline of the video. After the outline comes multiple choice, short answer, and discussion questions all related to what was just covered. Even if you had a High School aged independent learner, they would still need help from someone to 'discuss' the last set of questions. There is nothing to keep you from watching these videos as a family. There is nothing inappropriate for younger children, they just probably won't understand some of the concepts. This course can lead to a lot of great discussions even after the lesson questions. Emily is learning to evaluate everyday actions in light of their economics impact. I think she better understands now why we often bake our own bread, and save the $ to spend on other items (like field trips!) It doesn't take much time or many resources for one of us to make a loaf of bread, and when you figure we can easily spend $16 or more a month on bread... see my point? In the past, Emily didn't understand it very well, but now she does. If you are a plan-ahead type (A) person, you can read through the outline before you watch the videos. We aren't and we didn't. We watched the video, then we answered the questions. If your student needs to keep a record for their portfolio for an annual review or evaluation in your state, you could easily just print out the pages with the questions for each lesson, and have them write out their answers instead of doing it orally. Overall we really liked the Economics for Everybody Curriculum. Emily did point out that by lesson 5, the video clips are sometimes more modern (from the 1970's as opposed to the 1920's and 40's.) Don't worry, there are still a lot of silent film/ Charlie Chaplin clips used to illustrate Mr. Sproul's points in each lesson. 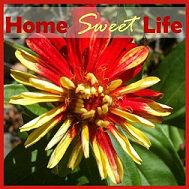 This course would make an excellent homeschool curriculum, as well as be beneficial for families and small groups. If you are mentoring a younger family (especially one that wants to know why they should stick to a budget) this would be helpful for them as well. If we are good stewards of what God has entrusted to us, we can better use HIS resources to help spread the Gospel. If it's time to get your family in line with solid, Biblical economic principles, click on over and order your copy now. I think you'll be glad you did!